Sociabl started in the corner of a back bedroom in Brandon’s family home in Adelaide. Thanks to a successful seed funding round, Sociabl raised over $150,000 from a variety of Australian and International investors including Brandon’s own family as well as Chinese businessman Xiao Cao Shiru and a high profile Melbourne BRW RICH LIST member. ” We have now opened discussions with industry leaders and VC’s across Australia and the US that values the company at around $7 to $9 million dollars” says Brandon. Brandon Reynolds – Brandon graduated Immanuel College in ’11 and headed to Melbourne at the ripe young age of 17 to study a Bachelor of Entertainment Business at JMC Academy. During this time Brandon was introduced to then 3-piece boy band 5 Seconds of Summer. After chatting with the boys about future prospects Brandon introduced the boys to Andrew Wilkinson, who went on to become their first manager. After dabbling around in the Australian Entertainment industry he began to look into future opportunities. During 2013 Brandon was called back to Adelaide to assist with his family’s business ‘The Yogurt Shop’. Brandon’s role within the company was Key Accounts Manager and during his 18 months in the role Brandon amassed over $6 million dollars in sales with national contracts for the yoghurt company. In 2015 Brandon took up a seat on the board on the family business and stepped out of day-to-day running of the family business to focus full-time on Sociabl. 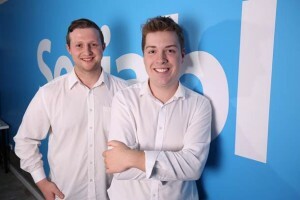 Brandon now heads up Sociabl’s staff of 11 across offices in Adelaide and Los Angeles. Jarrad Hrotek – Jarrad graduated high school in Adelaide in ’10. At the age of 19 Jarrad moved to Melbourne to study Audio Engineering at SAE Melbourne graduating in 2013. After a few years of working in nightclubs and festivals across Australia Jarrad decided to move back to Adelaide to be with family and explore other opportunities. Once back in Adelaide Jarrad started a position in the Commonwealth Bank. At this time Jarrad along with Brandon Reynolds founded Sociabl after months of discussion. After almost 18 months in the position at the bank, Jarrad is currently working within Management in the Commonwealth Bank’s Retail Banking Group. Jarrad has recently moved to a part-time position to allow him to dedicate more of his time to Sociabl’s core operations.